WHAT is inside a veggie patty? I asked myself this question while putting together the Food Network Favorite themes curriculum. And: HOW could I get kids to eat a veggie patty? I then SCOURED the internet for a good veggie patty that was made by a chef kids would know. I would say that name is HUGELY popular in the culinary world, right up with Jamie Oliver, Gordon Ramsay, etc. Bobby Flay’s recipe for veggie patties looked REALLY tasty and flavorful, but was too complex and time-consuming for a 1-hour enrichment class. I’m always asking myself: How can this recipe be taught to 100 classes this session taugh by 25 chef teachers? How can I modify the recipe so it’s doable within our time frame of and can then teach all my chef teaches how to teach 1,100+ students? This patty is ABSOLUTELY DELICIOUS. 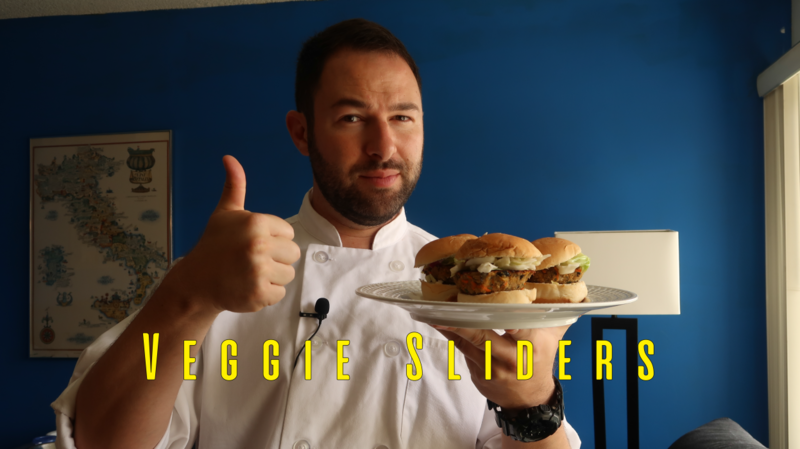 When I make it in that video, I never “fake” or “exaggerate” my experience when I get to take my first bite. It’s also so easy…just a few ingredients, all easy to come by, and then kids get the pleasure of forming it into patties. In a large bowl using the back of a fork, mash the chickpeas and black beans into a paste. Add the bread crumbs, eggs, cilantro, carrot, 2 tsp salt, 1 tsp pepper, garlic and mix well. Wet your hands with water and form into 24 small patties. In a large pan heat up 3 Tbs olive oil and cook the patties 6-8 minutes, flipping halfway, until nicely browned. In a small bowl whisk together the vinegar, 3 Tbs olive oil, sugar, 1 tsp salt and pinch of pepper. In a bowl add the cabbage, green onions and the dressing. Taste and adjust seasoning as needed. On each roll, add a patty, top with slaw, and serve. It’s Friday and I’m heading to Orange County for a very special dinner, with a very special entrepreneur friend. I’ll explain the meaning (and kooky backstory) to why we’re having this celebratory soon.